6. 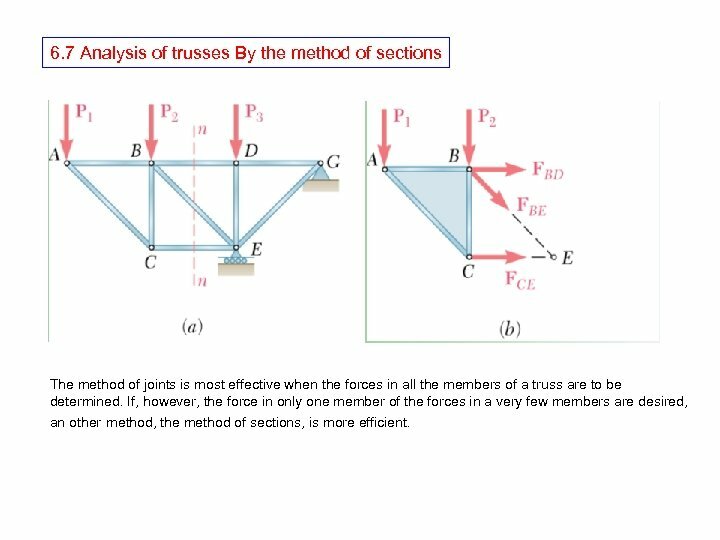 7 Analysis of trusses By the method of sections The method of joints is most effective when the forces in all the members of a truss are to be determined. 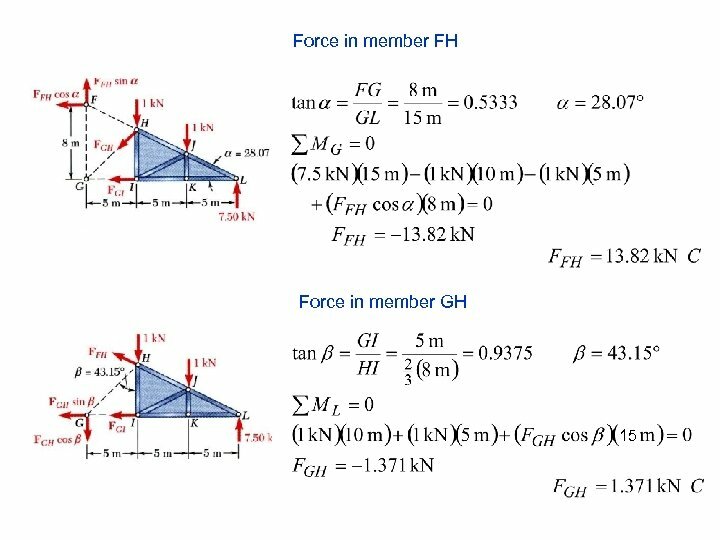 If, however, the force in only one member of the forces in a very few members are desired, an other method, the method of sections, is more efficient. 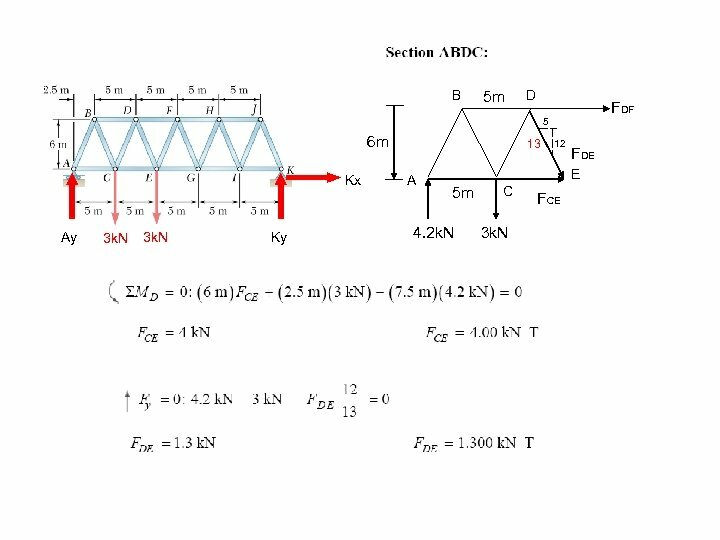 Assume for example, that we want to determine the force in member BD of the truss shown in figure 1(a). 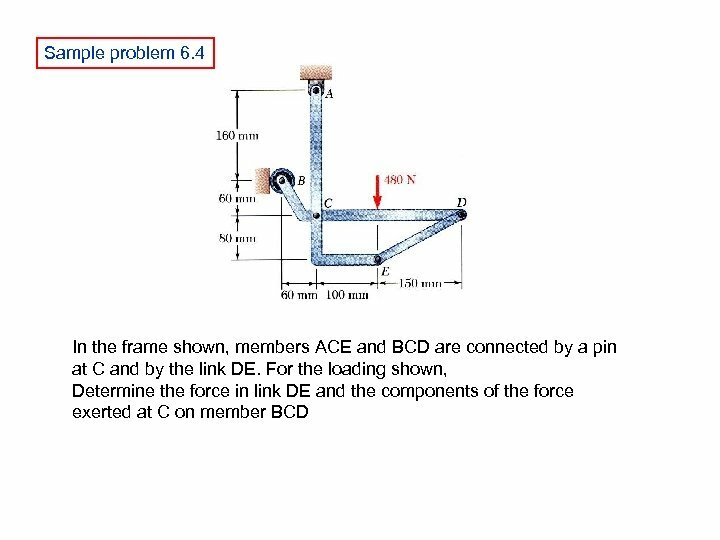 To do this, we must determine the forces with which member BD acts on either joint B or joint D. If we were to use the method of joints, we would choose either joint B or joint D as a free body. 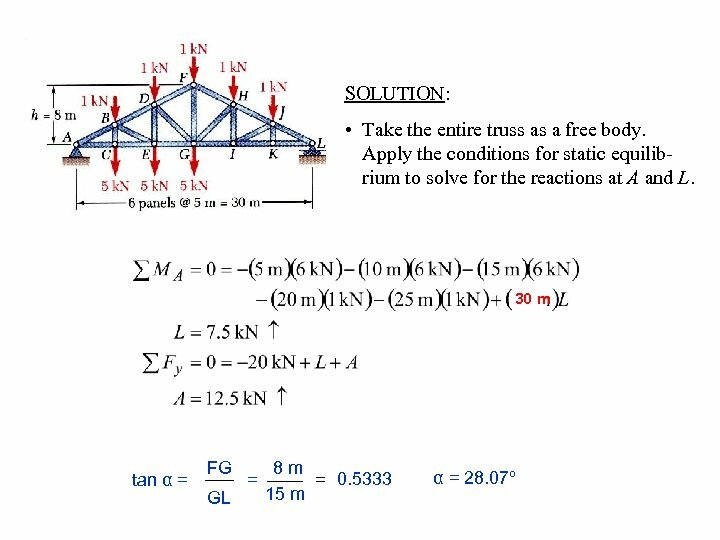 However, we can also choose as a free body a larger portion of the truss, composed of several joints and members, provided that the desired force is one of the external forces acting on that portion. 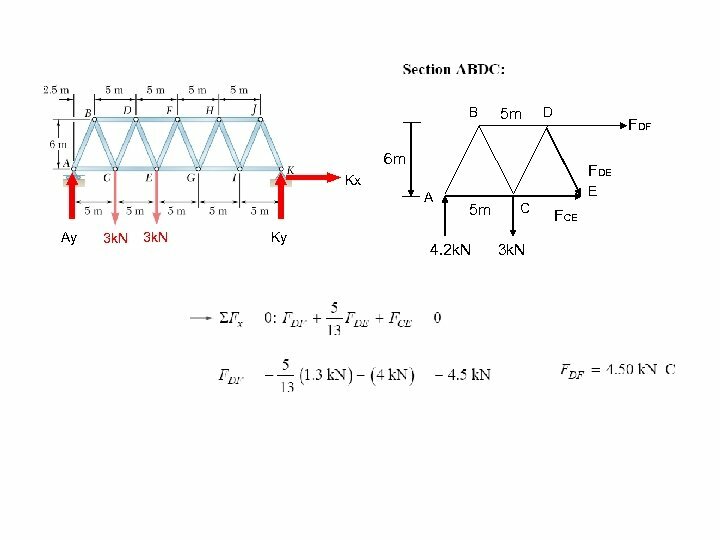 If, in addition, the portion of the truss is chosen so that there is a total of only three unknown forces acting upon it, the desired force can be obtained by solving the equations of equilibrium for this portion of the truss. 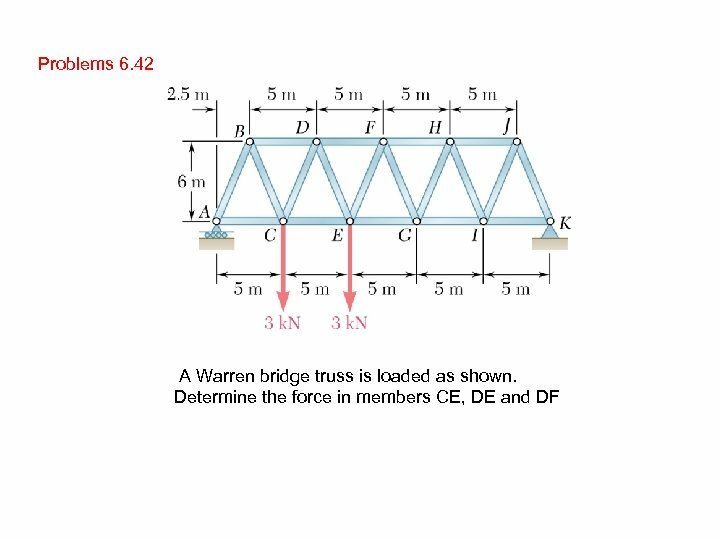 In practice, the portion of the truss to be utilized is obtained by passing a section through three members of the truss, one of which is the desired member, that is, by drawing a line which divides the truss into two completely separate parts but does not intersect more than three members. 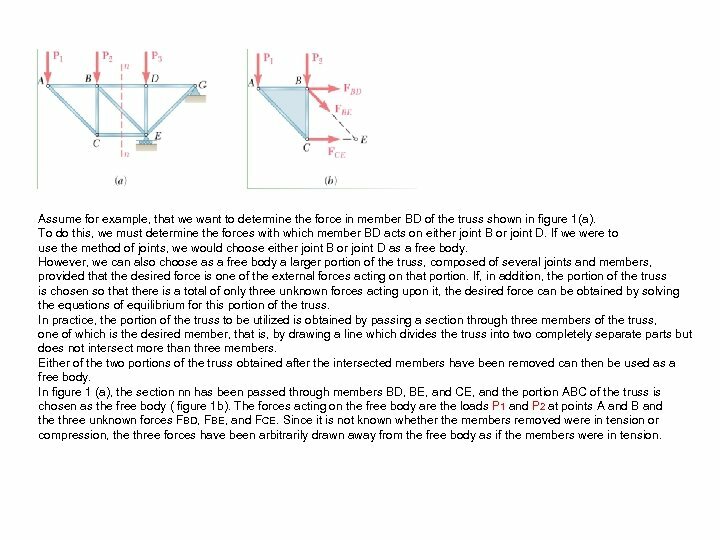 Either of the two portions of the truss obtained after the intersected members have been removed can then be used as a free body. 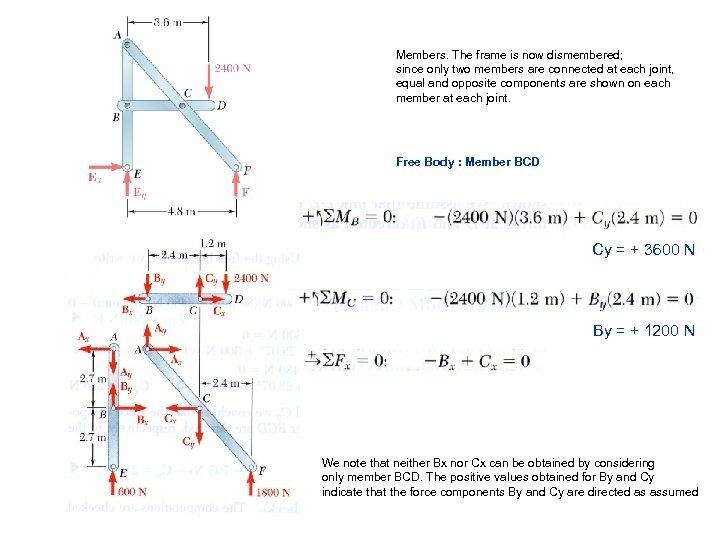 In figure 1 (a), the section nn has been passed through members BD, BE, and CE, and the portion ABC of the truss is chosen as the free body ( figure 1 b). 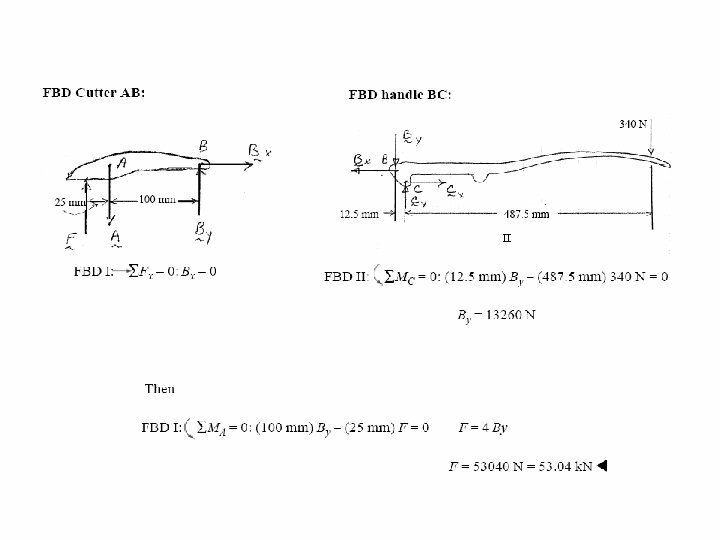 The forces acting on the free body are the loads P 1 and P 2 at points A and B and the three unknown forces FBD, FBE, and FCE. 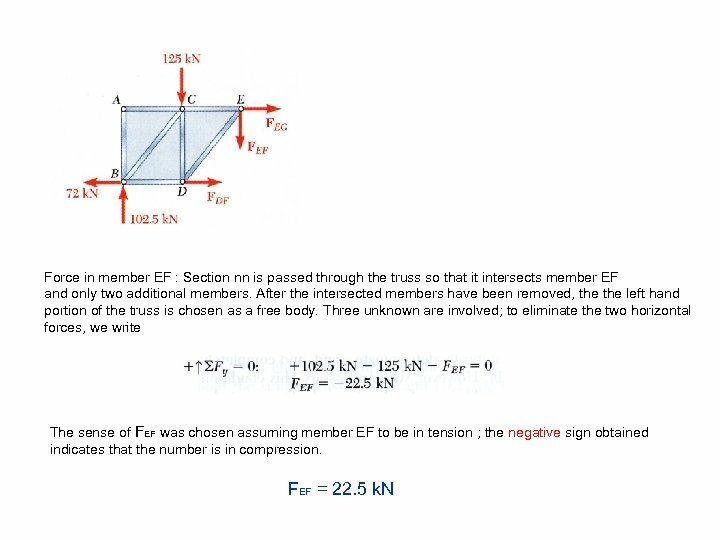 Since it is not known whether the members removed were in tension or compression, the three forces have been arbitrarily drawn away from the free body as if the members were in tension. Sample problems 6. 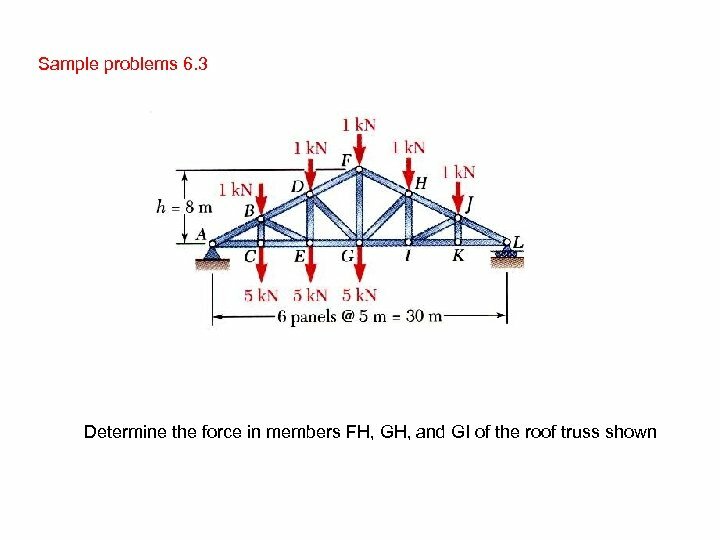 2 Determine the force in members EF and GI of the truss shown. 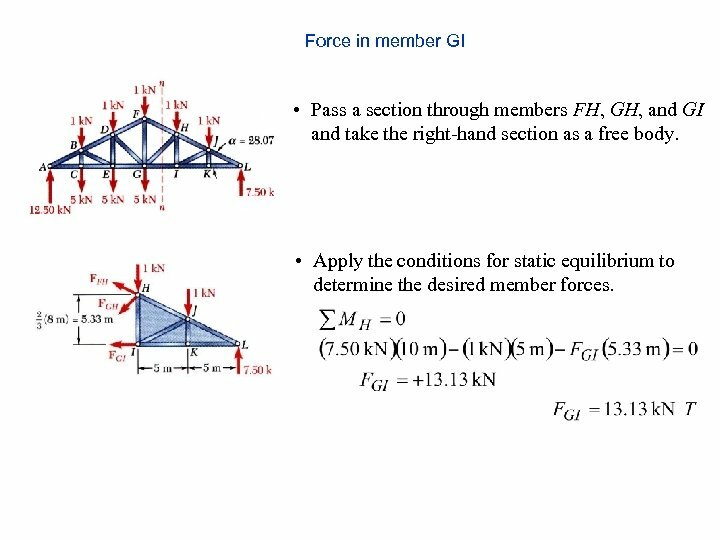 Force in member GI • Pass a section through members FH, GH, and GI and take the right-hand section as a free body. 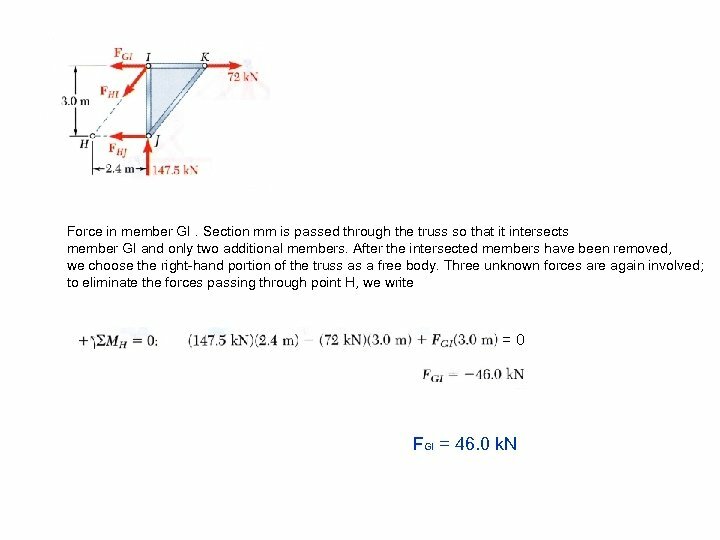 • Apply the conditions for static equilibrium to determine the desired member forces. 6. 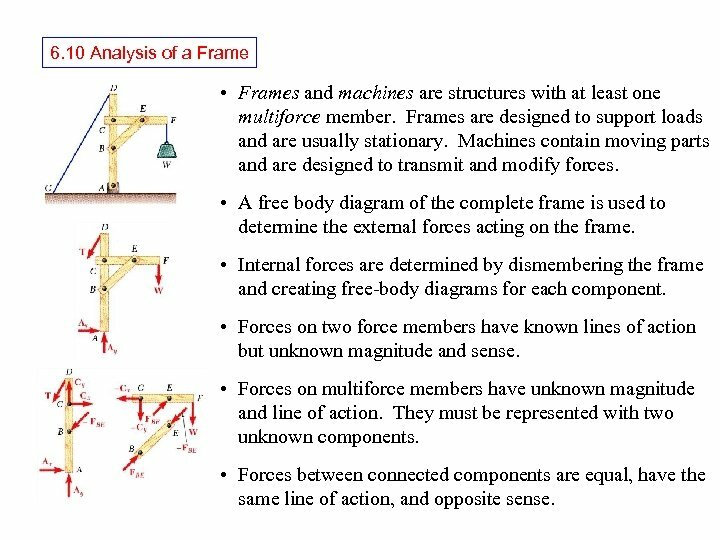 10 Analysis of a Frame • Frames and machines are structures with at least one multiforce member. 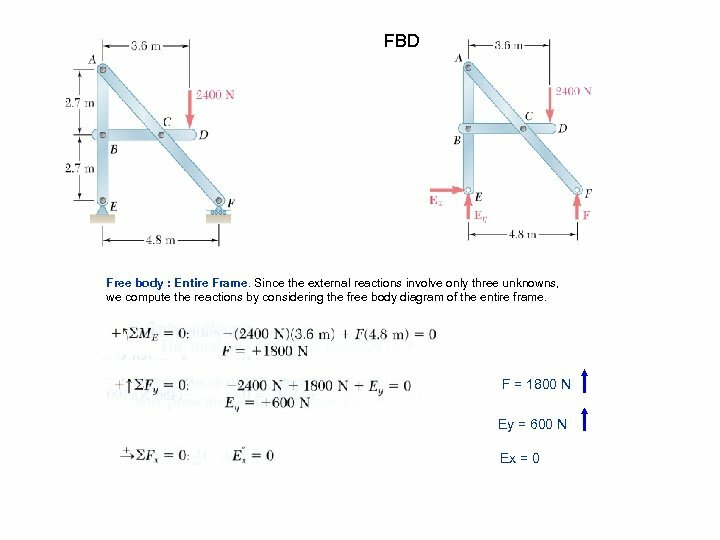 Frames are designed to support loads and are usually stationary. 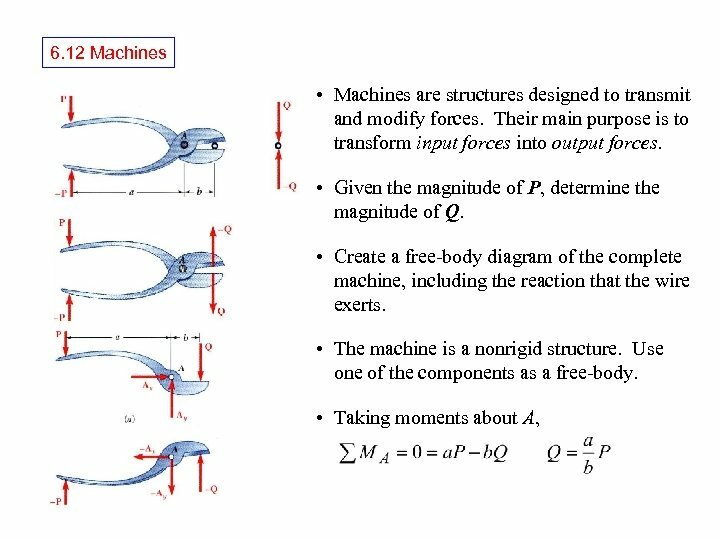 Machines contain moving parts and are designed to transmit and modify forces. 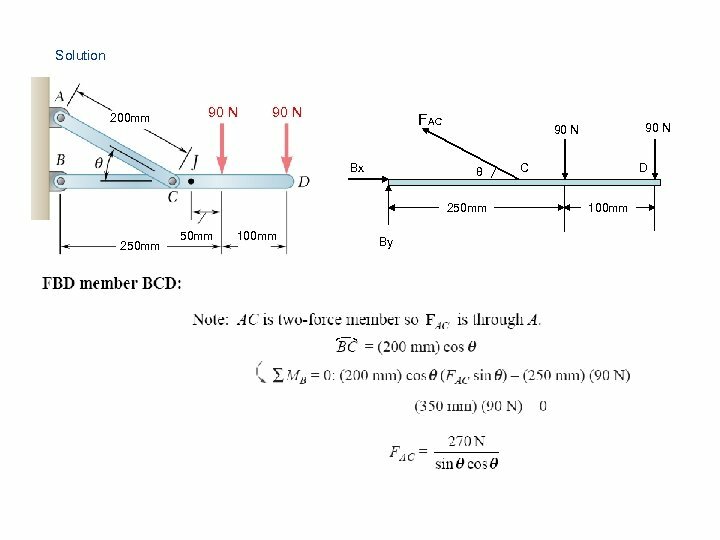 • A free body diagram of the complete frame is used to determine the external forces acting on the frame. 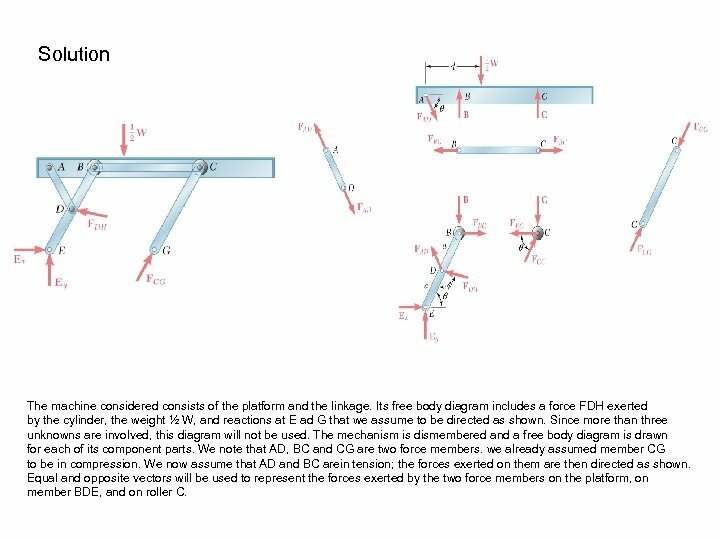 • Internal forces are determined by dismembering the frame and creating free-body diagrams for each component. • Forces on two force members have known lines of action but unknown magnitude and sense. 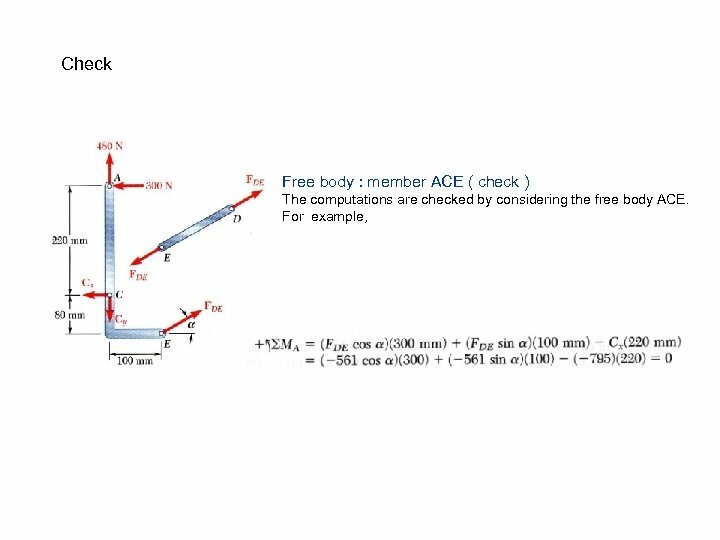 • Forces on multiforce members have unknown magnitude and line of action. They must be represented with two unknown components. 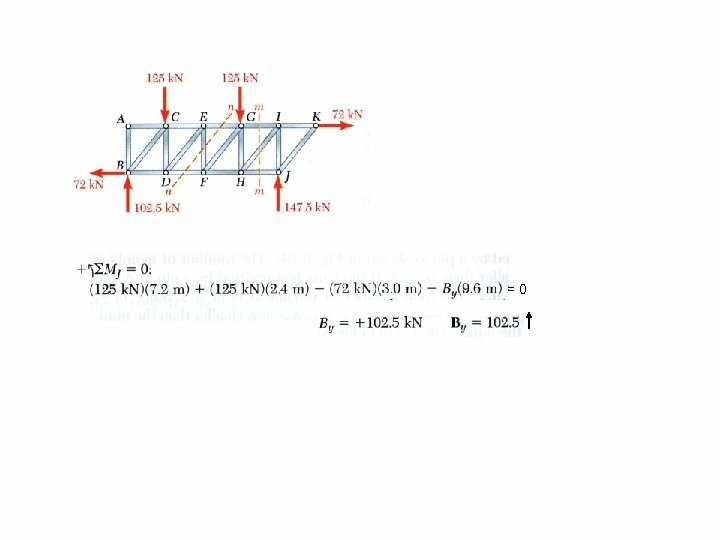 • Forces between connected components are equal, have the same line of action, and opposite sense. 6. 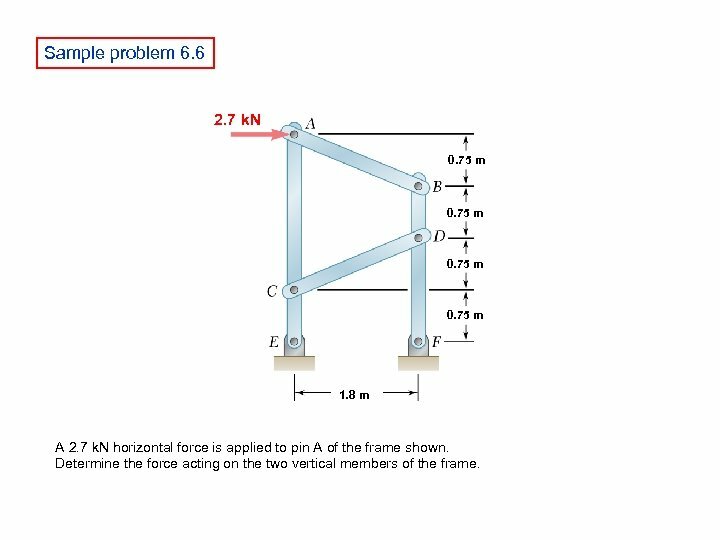 11 Frames which cease to be rigid when detached from their support • Some frames may collapse if removed from their supports. 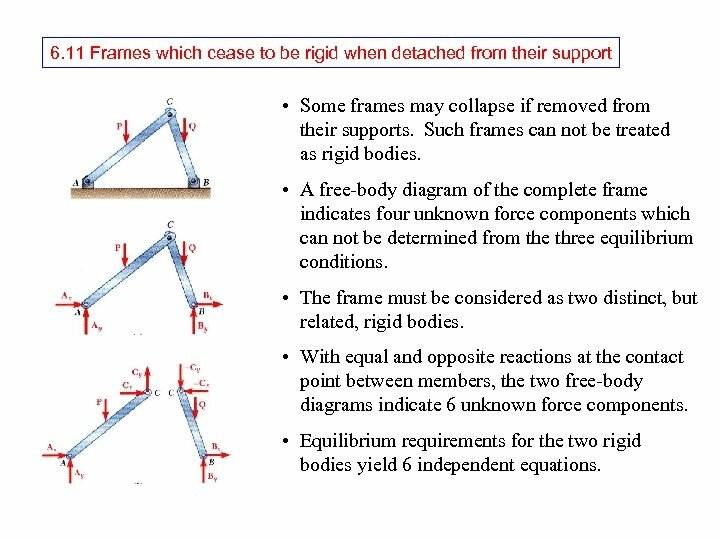 Such frames can not be treated as rigid bodies. 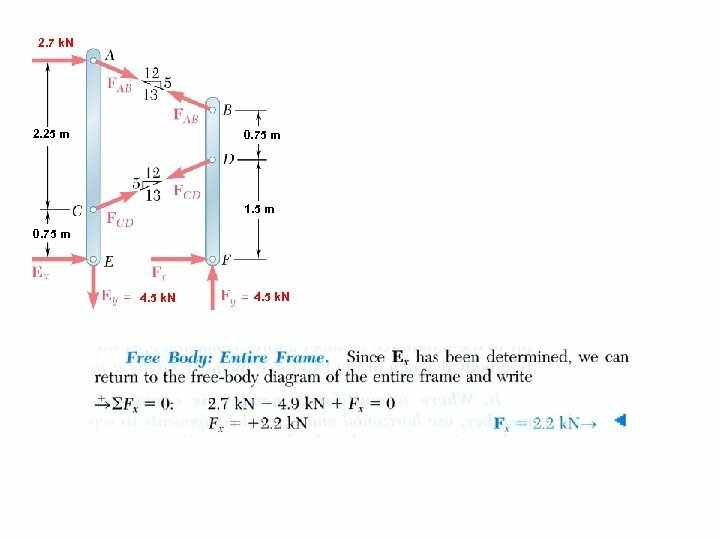 • A free-body diagram of the complete frame indicates four unknown force components which can not be determined from the three equilibrium conditions. 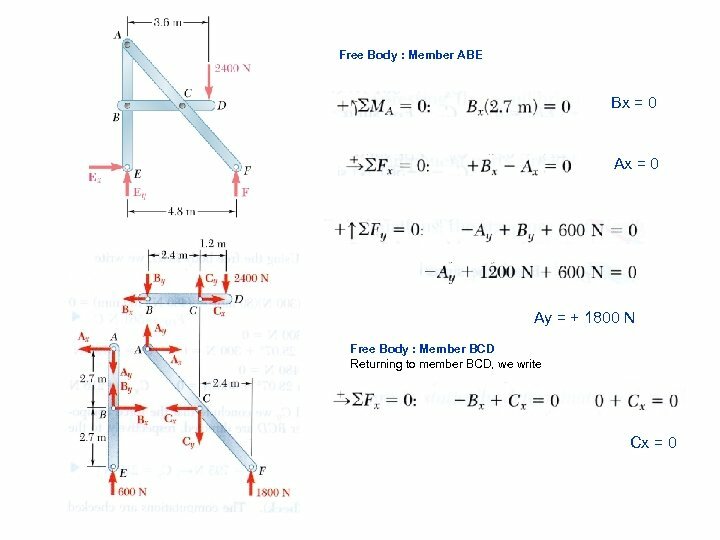 • The frame must be considered as two distinct, but related, rigid bodies. 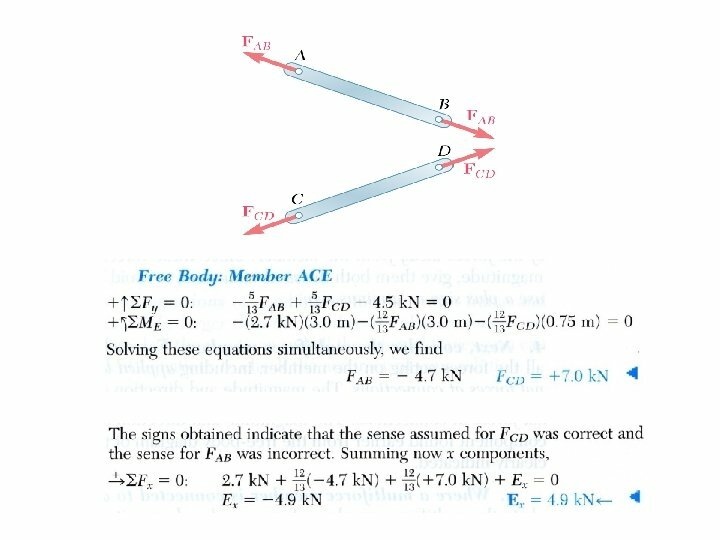 • With equal and opposite reactions at the contact point between members, the two free-body diagrams indicate 6 unknown force components. 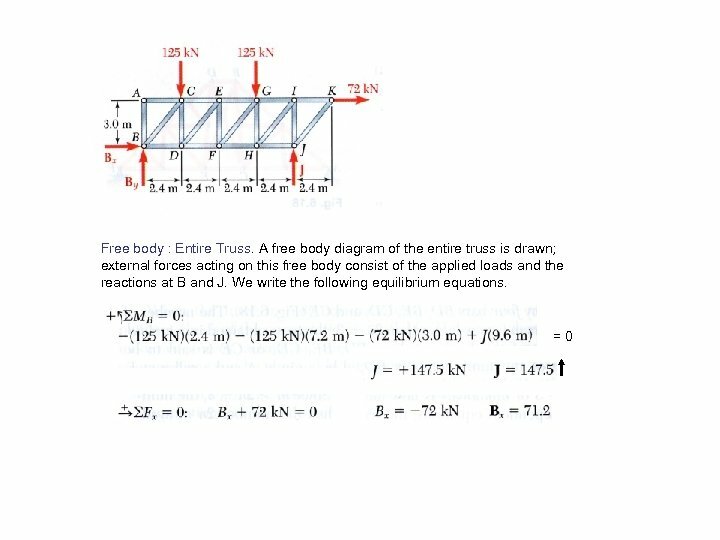 • Equilibrium requirements for the two rigid bodies yield 6 independent equations. 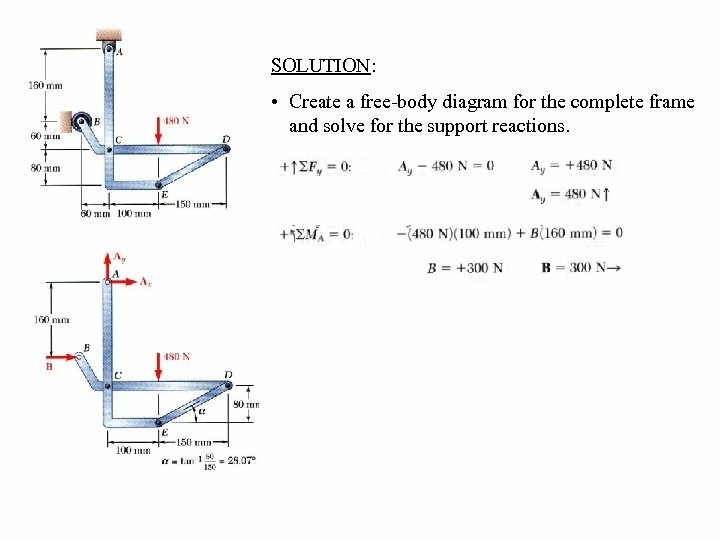 SOLUTION: • Create a free-body diagram for the complete frame and solve for the support reactions. 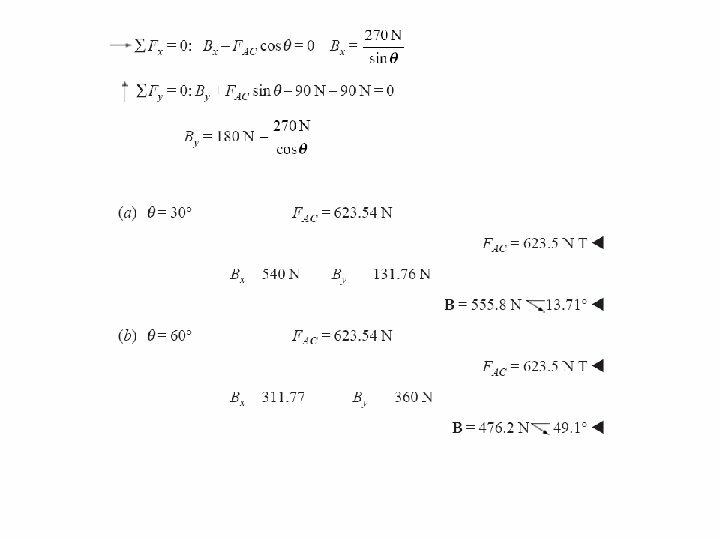 Sample problem 6. 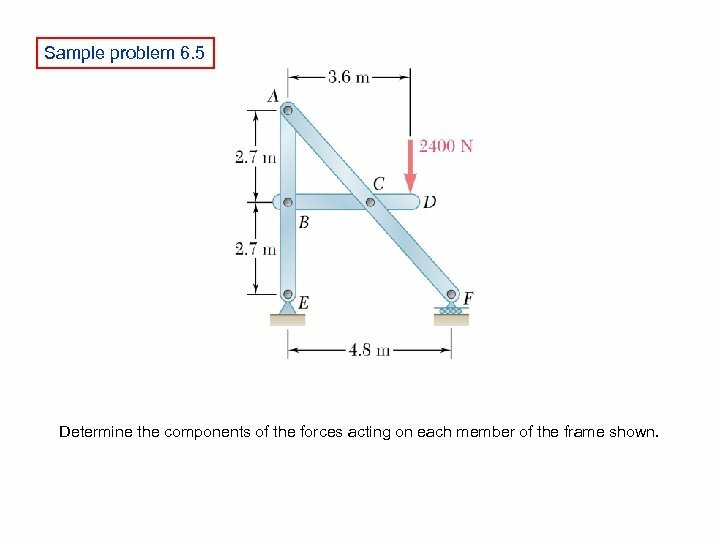 5 Determine the components of the forces acting on each member of the frame shown. 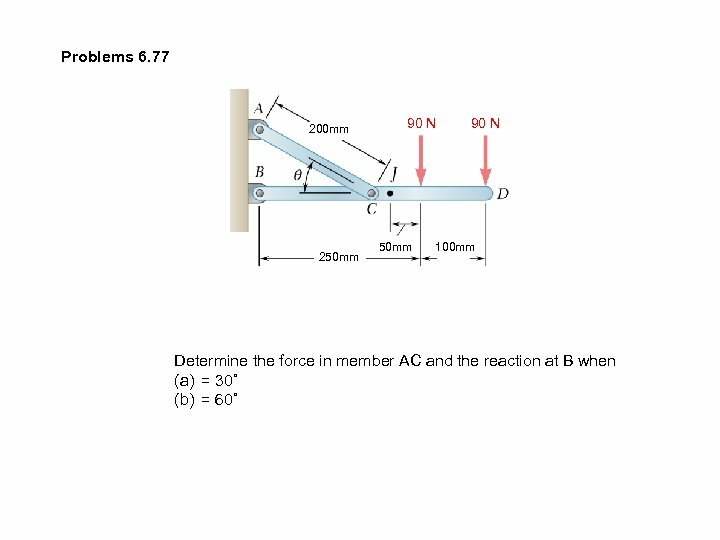 Sample problem 6. 6 2. 7 k. N 0. 75 m 1. 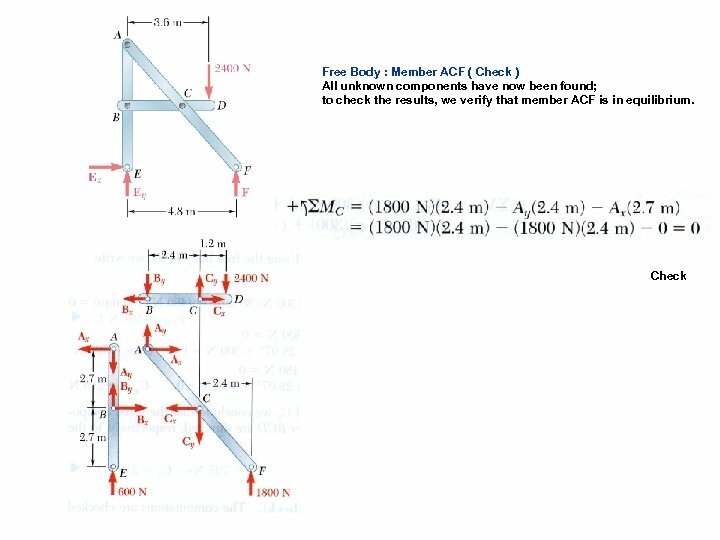 8 m A 2. 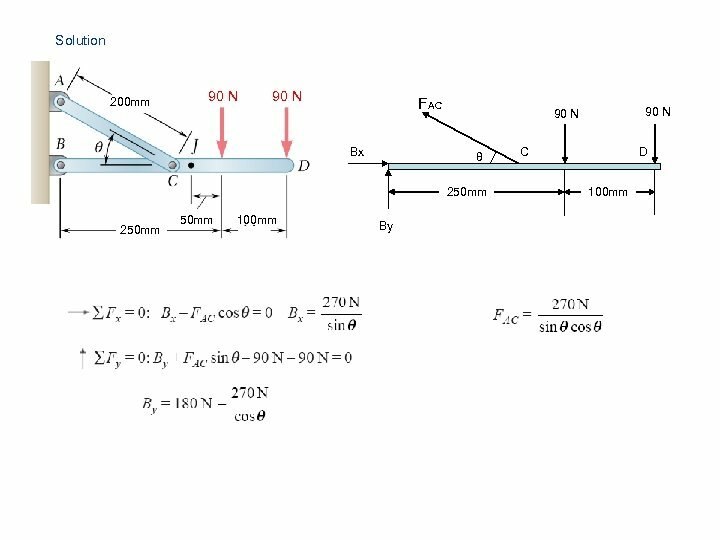 7 k. N horizontal force is applied to pin A of the frame shown. 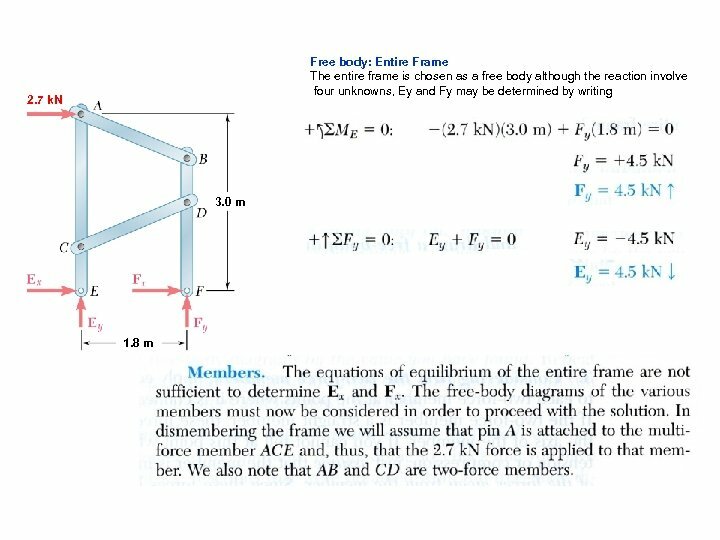 Determine the force acting on the two vertical members of the frame. 6. 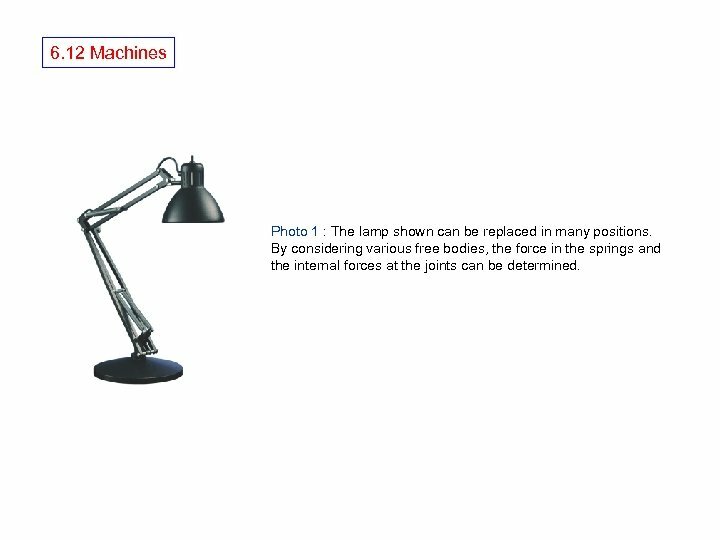 12 Machines Photo 1 : The lamp shown can be replaced in many positions. 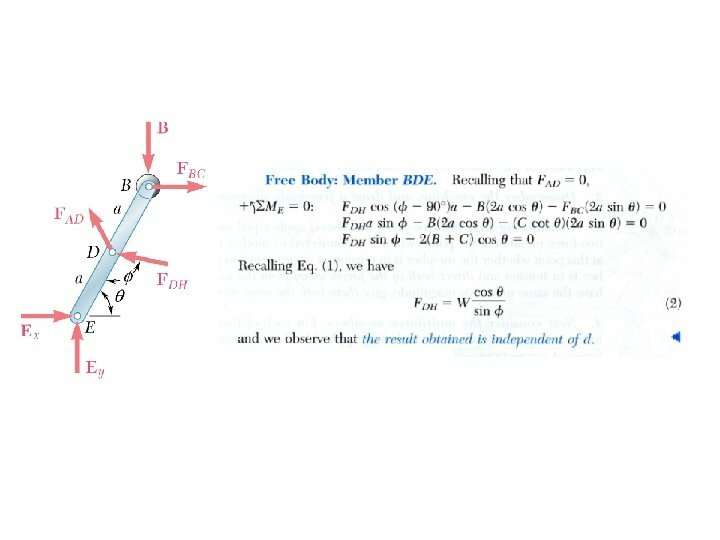 By considering various free bodies, the force in the springs and the internal forces at the joints can be determined. 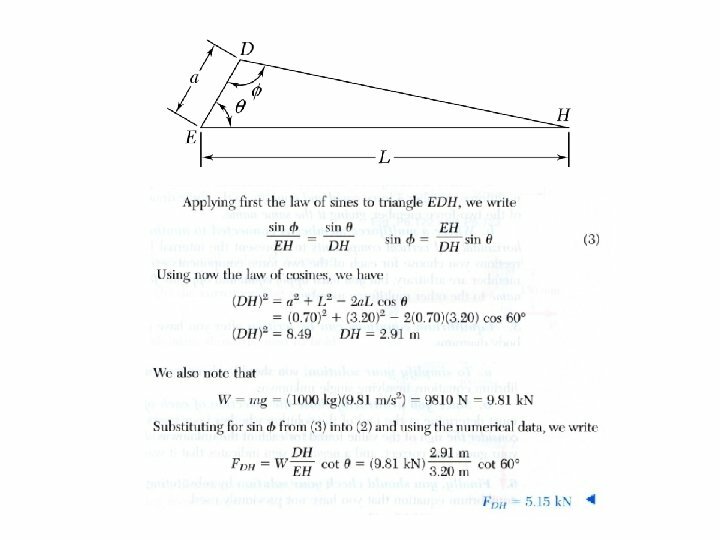 Sample Problem 6. 7 A hydraulic-lift table is used to raise a 1000 kg crate. It consists of a platform and two identical linkages on which hydraulic cylinders exert equal forces. 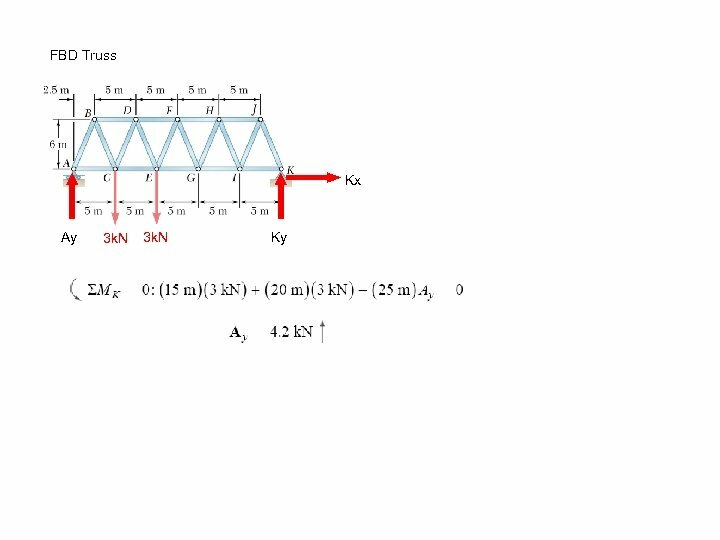 (Only one linkage and one cylinder are shown. 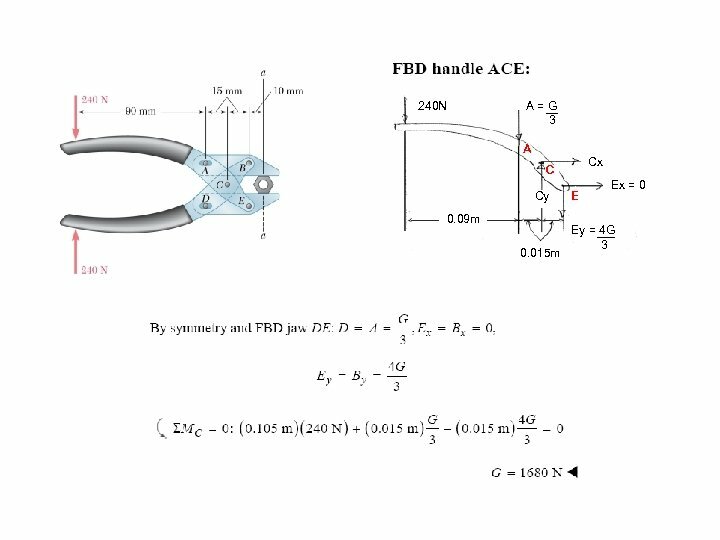 Members EDB and CG are each of length 2 a, and member AD is pinned to the midpoint of EDB. 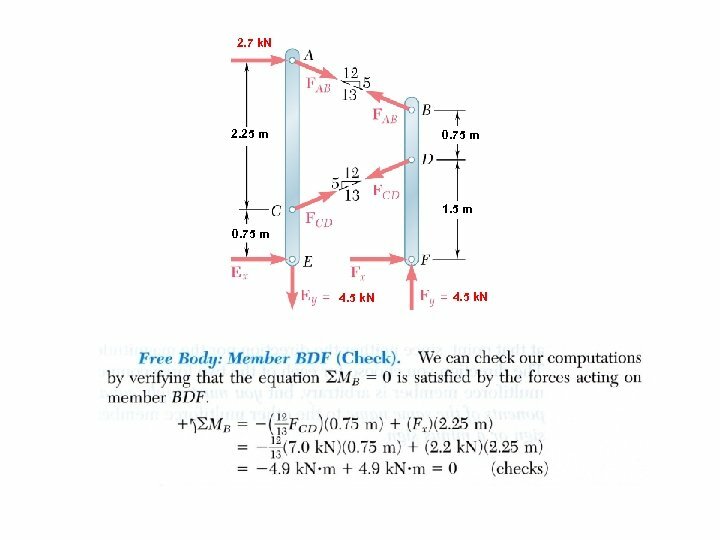 If the crate is placed on the table, so that half of its weight is supported by the system shown, Determine the force exerted by each cylinder in raising the create for θ= 60˚ , a = 0. 70 m, and L = 3. 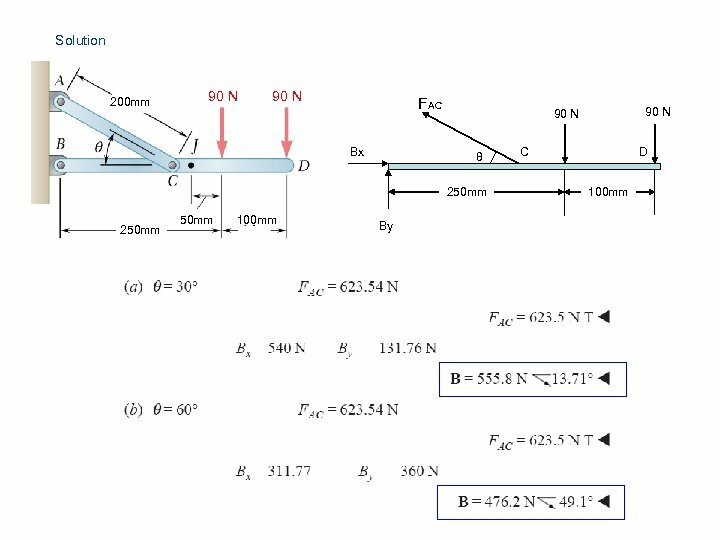 20 m. Show that the result obtained is independent of the distance d.
Solution The machine considered consists of the platform and the linkage. 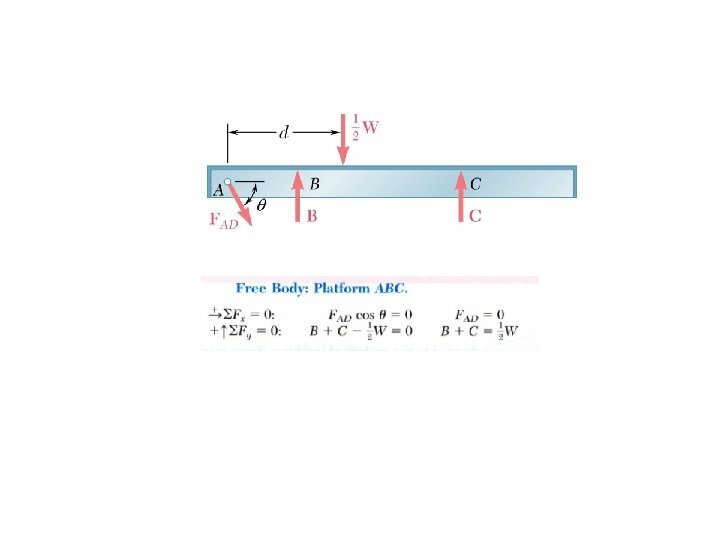 Its free body diagram includes a force FDH exerted by the cylinder, the weight ½ W, and reactions at E ad G that we assume to be directed as shown. Since more than three unknowns are involved, this diagram will not be used. The mechanism is dismembered and a free body diagram is drawn for each of its component parts. 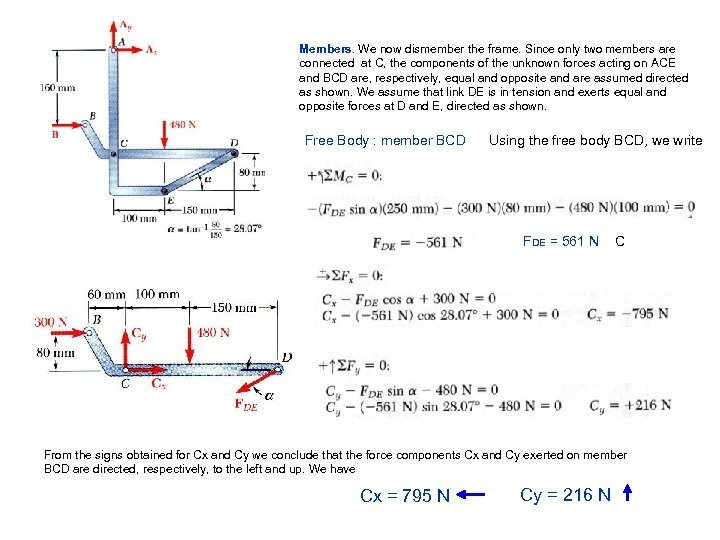 We note that AD, BC and CG are two force members. we already assumed member CG to be in compression. 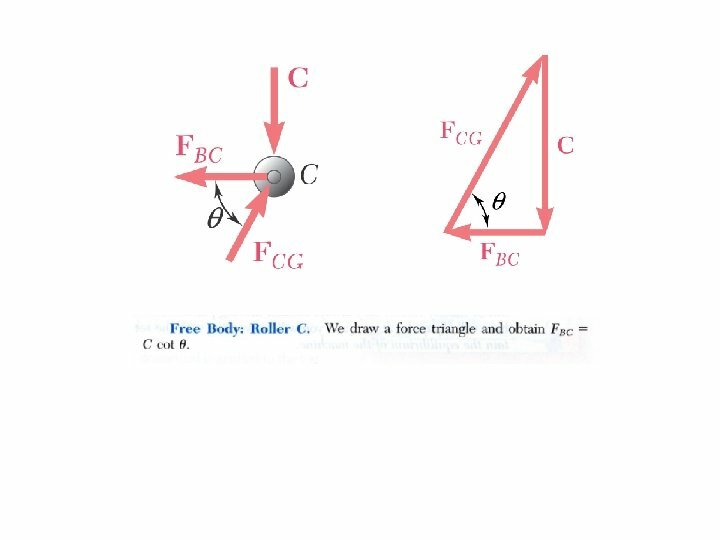 We now assume that AD and BC arein tension; the forces exerted on them are then directed as shown. 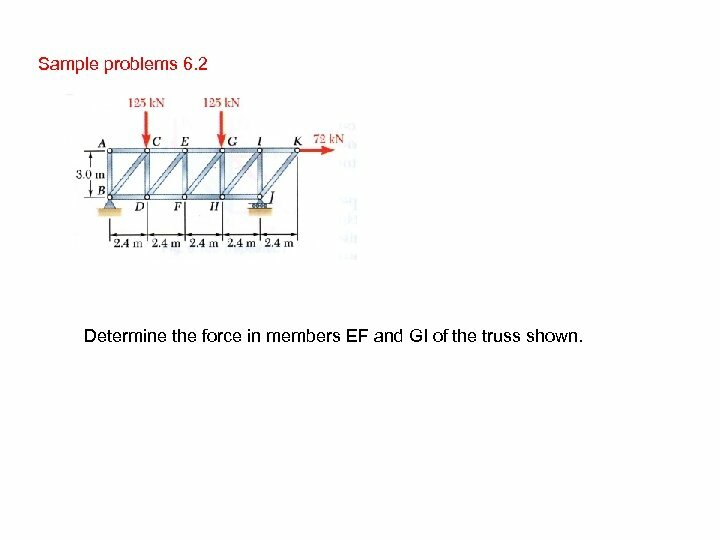 Equal and opposite vectors will be used to represent the forces exerted by the two force members on the platform, on member BDE, and on roller C.
Problem 6. 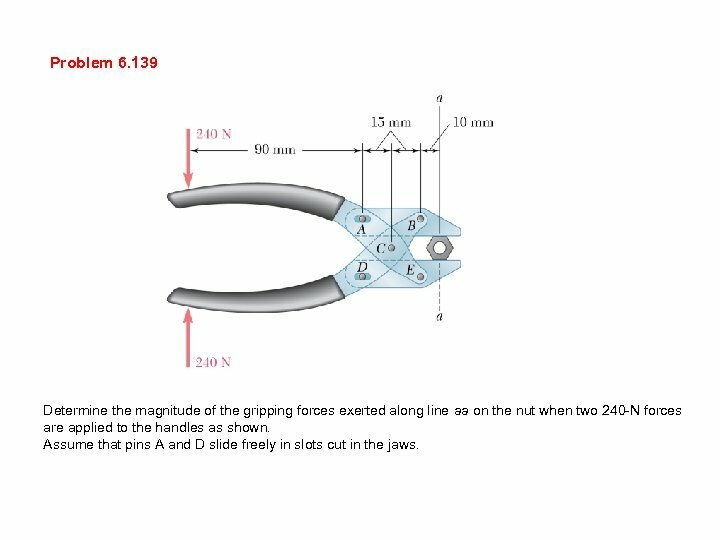 139 Determine the magnitude of the gripping forces exerted along line aa on the nut when two 240 -N forces are applied to the handles as shown. Assume that pins A and D slide freely in slots cut in the jaws. 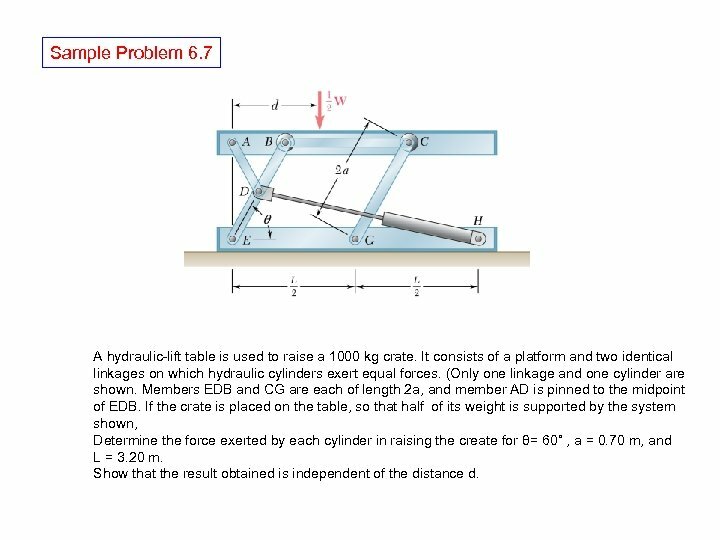 Problem 6. 140 340 N 12. 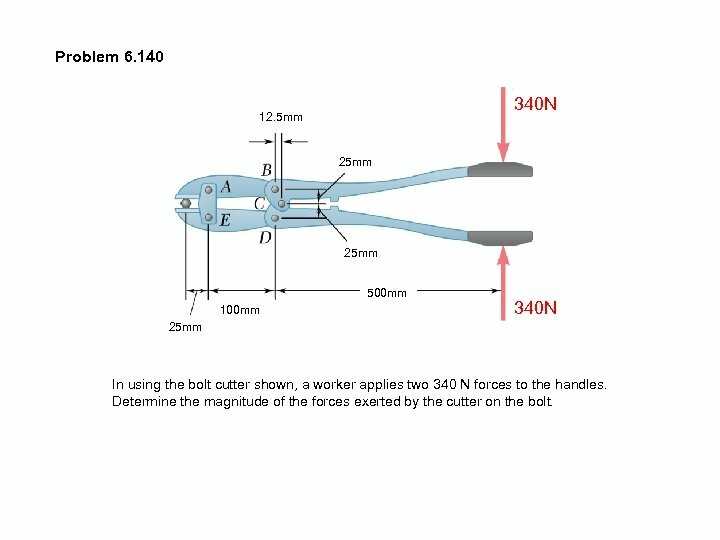 5 mm 25 mm 500 mm 100 mm 340 N 25 mm In using the bolt cutter shown, a worker applies two 340 N forces to the handles. 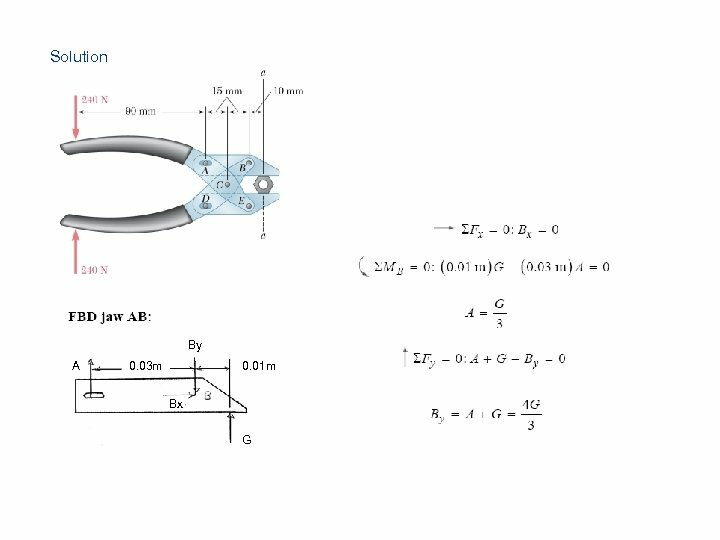 Determine the magnitude of the forces exerted by the cutter on the bolt.